Happy Monday, everyone! I'm starting to feel the "Christmas Crunch". Anyone else? It's probably because we are heading to The Happiest Place on Earth next week, and won't be back until just before Christmas! I have to do all my baking, shopping, mailing, gift-giving, etc. by the end of the week! Yikes! 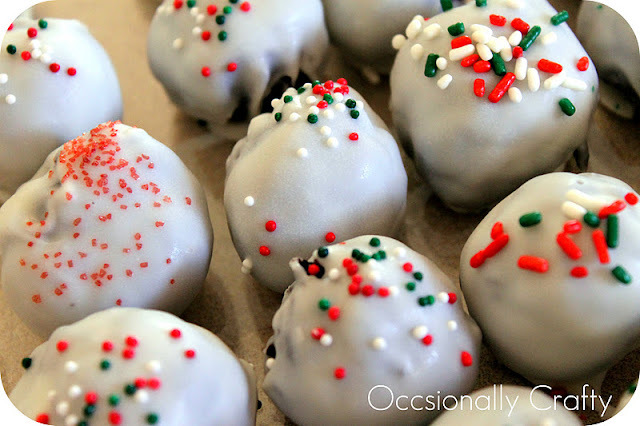 In case you're searching for a simple gift to make for neighbors, friends, or even a class, I have an idea for you. 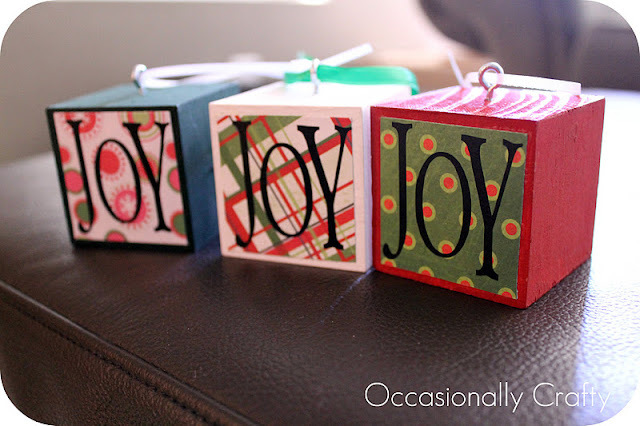 This year, my friends and I made these simple "Joy" ornaments for the children at church. They're simple to make. We used 2x2 blocks (which I buy in bulk from www.craftparts.com). We painted them, Mod Podged some paper scraps on the front, and finished with Joy in vinyl letters. You could easily use letter stickers or even a Sharpie to do something similar if you don't have access to vinyl. To hang them, I drilled tiny holes in the top, then screwed in eye hooks from the hardware store. A length of ribbon makes a great hanger. We finished by writing our name and the year on the back. What are you giving your neighbors this year? 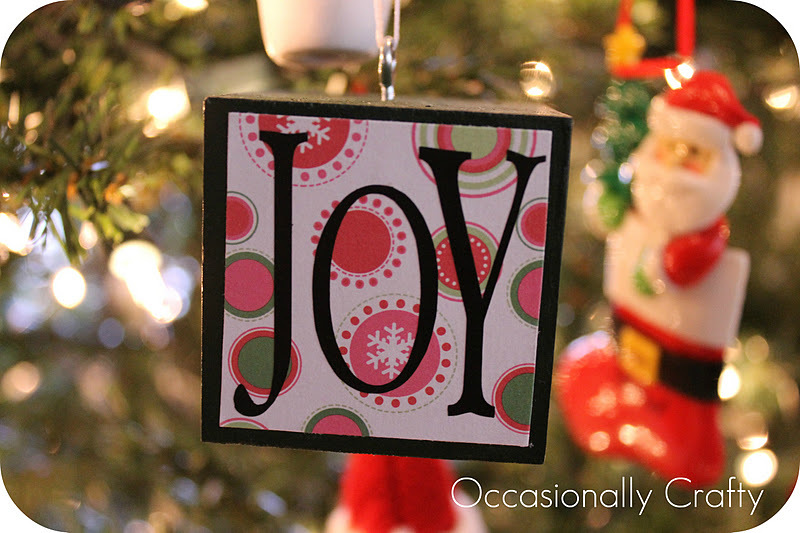 I'm linking up these ornaments to some of my favorite parties: I'd love to "see" you there too! I love those ornaments! I officially became a follower today too! Love these - I've pinned them for next year! I found you at Sundae Scoop link party, thanks for sharing with us! PS - I wish I could have been the one to put you over the top, but I'm #599...just one more to go! Congrats! It is a great post and a great idea. Always I wanted to jazz up the icons on my websites a little. It has some important idea. This is very nice post! I will bookmark this blog. Choosing an ideal existing for a certain Customized gifts is a trial to do. Yes, especially if you do not know his or her character and passions. You will definitely spend hours in shops trying to discover the most ideal existing for him or her. When individuals shop for a existing, one way to ensure that he or she will really like the existing is to customize it. There are many personalized provides to select from. Of course, that all depends on the event and your price range.